"An art journal is something between a diary hidden under the mattress not to be seen by anyone and a painting hanging in a gallery to be seen by everyone. It makes no distinctions between artists and non-artists. It places me in one line with humanity, not inferior, nor superior, but as a woman who writes and paints in a book, not more and not less." Art Journaling is the process of keeping a regular record, usually in book form, of events, musings, thoughts, dreams (awake or asleep) and expressions of your life in images as well as in words. The purpose behind art journaling is no different than in regular journaling: processing current issues whether joyful or sad, greater self-awareness and insight, fulfillment and self-expression. In sum, art journaling is a way of connecting with those deeper parts of your Self. More than just writing or making art, art journaling can be a great path towards opening up to being more creative in a way that feels safe and contained. Happening in the pages of your journal and being done for yourself, you can truly work in way that allows for the emergence of all of that which makes you, YOU. Who should try Art Journaling? * If you are trying to find more fulfilling ways to express yourself than just plain journaling, art journaling is a nice change. * If you feel intimidated by the whiteness of a page, art journaling is a safe place to start. * If you are trying to find your true voice, art journaling can be your guide. 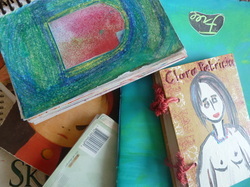 * If you've been wanting to be more creative, art journaling can help jump start your creativity. Art Journaling includes and combines the use of a variety of art supplies and art-making methods such as collage, watercolors, acrylics, stamps, etc. No need to have any prior experience. Just be willing to experiment and try it out!